Brands have typically been one step behind the industry, often outsourcing most of their marketing capabilities to agency partners. With fragmentation of online media making it harder to reach people, advertisers are forced to become more sophisticated in the way they spend their budgets to promote their brands across a plethora of channels. The Digiday Brand Summit Europe will bring together the industry’s most progressive marketers. We'll discuss how brands are measuring the effectiveness of campaigns, their views on platforms and brand safety, supply chains, new opportunities for commerce and structural changes to marketing teams. Submit your information to be contacted about opportunities to sponsor, speak and attend this event and others like it. Digiday Connect helps you get the most out of our summits by matching you with the perfect prospect. 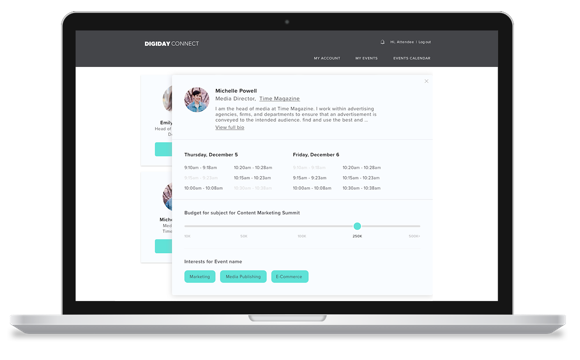 Use our new platform to get transparency into the budgets of buy-side attendees as well as a look at the solutions they’re searching for. A welcome address by Digiday's UK editor Jess Davies, a look at the trends that we will focus on for the summit and the infamous Digiday Challenge Board. The disconnect between procurement and marketing teams is well-known and even with the best intentions procurement can present a roadblock to change if marketers aren't looking for the correct specs. This session will cover the key considerations that a procurement team will factor in when looking at new tech, give you the inside track on what questions you should be asking and tell you how best you can start working with your procurement team in order to evolve your marketing output. Data-driven marketing transforms mass media buys into focused campaigns, but ensuring that you have the correct targeting, frequency and reach can be a matter of trial-and-error. This session will look at how you transform your media buys into targeted campaigns and how this intersects with GDPR. We will also look at what it takes to drive these changes at an operational level, including making an assessment of what tech you need and working with procurement to build an RFP. Vertical Video: What’s all the Fuss About? The explosion of the Stories format on Snapchat and Instagram has turned vertical video into a format people love to watch. Advertisers are responding with investment, whether that’s building brand awareness or converting followers into customers with videos that grab their attention. This case study showcases clever uses of stories, tips for what not to do and how you can measure success. Implementing blacklists and whitelists to ensure ads appear only on certain sites is an effective safeguard against inappropriate content, but it also inherently limits how many people marketers can reach with their campaigns. Similarly viewability is a limited measurement because a view doesn’t equate to an action taken or uplift in brand affinity. How can advertisers look at these metrics in a new light? Attendees will split off into groups focusing on one of three key challenges facing brand marketers. With guidance from group leaders, each group will meet throughout the summit to work discuss best-practice in addressing this challenge. The findings will be presented at the end of the summit. Brand safety is top of mind for every marketer. Despite intense scrutiny since the brand safety issue first came to light in 2017, it is still a key issue for advertisers. This working group will explore how advertisers can control their targeting and media placements to ensure brand safety at scale. From in-housing to hybrid models, transparency to auditing, the agency model is in a state of flux. This working group will explore the strategies, processes and talent advertisers can put in place to get the most from their agencies. With data privacy regulation becoming more prevalent, old measurement challenges and dated targeted mechanisms need to evolve to accommodate those privacy concerns. This working group will explore how advertisers can stay in front of emerging regulations around the data they use to reach consumers. This town hall will address the challenges raised on the Digiday Challenge Board. Led by Digiday editorial, this is an opportunity to discuss your challenges alongside your peers and not only to listen, but also to participate. The 8-minute business meetings connect participants with innovative technology platforms. They are designed to help your team build valuable new relationships and ultimately, close business deals. Please make sure that your profile is up to date at schedule.digiday.com. Don't have dinner plans? Digiday has made a reservation at a local restaurant for you to enjoy. Sign up at the registration desk. Costs at your own expense. Please join your fellow conference attendees for one last drink of the night. Costs at your own expense. Few roles in advertising will be subject to as much change over the next years as that of the marketer. From the slow death of traditional advertising channels to the rise of new ones, marketers must work more innovatively to accomplish their goals. Royal Bank of Scotland’s CMO and former president of the World Federation of Advertisers David Wheldon will reveal how marketers can ready their brands to prosper in the new marketing landscape. From tackling transparency issues, to rewiring agency partners, buying more fragmented online media to working with procurement, this session will cover the most pressing concerns and potential solutions for advertisers. Data has unlocked huge potential for marketers, improving effectiveness and driving scale in a way many could never have imagined 50 years ago. But recent data scandals and new privacy regulations are now raising questions around the ethics behind the data. In this session, leading members of the World Federation of Advertisers’ Data Ethics Board will discuss what this means for marketers, and explore how companies can embrace data as a force for good in society. Not all advertisers do content marketing, but should they? This session takes a closer look at Bailey's content marketing strategy - why they decide to do what they do and how they go about it. Learn how they measure the success of this strategy and work to ensure that this well-known brand stays relevant in an overcrowded content ecosystem. Media fragmentation is allowing an opportunity for smaller brands to be heard that has never happened before. This session will look at how this new media landscape is changing the consumer purchase behaviour, why it matters to everyone, and what you can do about it to secure your future share of basket. In-Housing: What Are Your Options? There’s no one-size-fits-all solution when it comes to how much media buying should be bought in-house versus outsourced to an agency. It can be difficult to know how much you can and should take on, and how to work with agencies to ensure that you’re maximizing value. This session will walk you through your options. In many advertisers, there is a disconnect between the marketing and procurement teams, and this can lead to stagnancy in the marketing team, as you may not know what questions to ask. This masterclass will walk you through the considerations that you should be taking into account when looking to evolve your tech stack. Don't have dinner plans? Digiday has made a reservation at a local restaurant for you to enjoy with your new friends. Sign up at the registration desk. Costs at your own expense. Join your new friends for one last drink before you head off to bed. Costs at your own expense. For the last morning, we will switch the format up and give you practical tips to take back to your organization. These sessions will be part presentation, part discussion and will tackle some of the practical challenges facing brand marketers. If You Leave Your Agency Tomorrow, What Should You Take With? Traditional advertiser/agency relationships have resulted in the abdication of control of ad tech and data to agencies. If brands decide to leave their agency, the IP and data will remain within those businesses. How can you own your contracts to be able to take this value wherever you go? Influencer marketing is spreading fast, but to become a key channel for advertisers there are challenges to overcome. From finding the right talent to selecting the right metrics to track then against, it’s more important than ever to think about the role influencers play in a marketing strategy given the valuable reputations at stake. This session will explore how Kellogg’s has evolved its own way of working with influencers over the last six months. When budgets are set for media buying vs. content, this can neglect to consider the performance and ROI of pieces of content that perform well - how can you manage this? Advertisers are starting to call the shots on what ad tech vendors they use to buy their ads. While the digital capabilities within the agencies has exploded over the past few years, the complexity of ad tech has grown at an even faster rate, meaning advertisers must think about these businesses differently to other partners. This session will explore what marketers should prioritize when choosing ad tech vendors. Fancy a pint of Guinness? Please join your fellow conference attendees for one last drink of the night. Costs at your own expense. Slainte! Don't have dinner plans? Digiday has made a reservation at a local restaurant for you and your new friends to enjoy. Sign up at the registration desk. Costs at your own expense. One. More. Drink. Please join your new friends for one last drink of the night. Costs at your own expense. Slainte! Want to get involved? Check out our sponsorship opportunities and pick the one that's right for you. This was a fantastic summit that allowed for honest conversations across the industry. It has made me even more passionate about the future of our brand. The Digiday Brand Summit Europe was a great event to get new international perspectives from different industries. Fantastic opportunity to meet people from across the industry who have a wide variety of backgrounds in digital including social, email, search and more. To book your stay at the Powerscourt Hotel, please use this link to receive a special room rate of €265 per night, plus tax. Please note: The cut-off date for that room rate is April 23 by 12 a.m. EST or whenever the room block fills. Are you a brand marketing or agency executive? You could be eligible for a VIP pass.